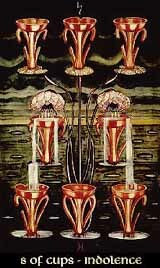 The Eight of Cups has driven the debauch of the Seven to absolute excess, the delusions have lost all attraction and all that's left is frustration. The sequence of the numbers has reached Hod, calling for structure and logic, but the emotional waters of Briah cannot be happy with this call and remain in dumb resignation. Nevertheless, happy or not, the call must be heard to leave the bogs of numbness, and the Eight of Cups tells us to abandon the past, leave the current situation, make up our minds most honestly and open our eyes to upcoming changes.